IV- (bony) -6"-0" Painted on the river-left bridge piling where Adako Road crosses the creek. Turn onto USFS Road 1328, park, and walk to the gauge. Readings are done from the bottoms of the numbers (i.e., the level is 0 when the water has just reached the bottom of the painted "0"). Generally runnable when the Johns River at Arneys Store gauge is at least 300 cfs and rising; 400-500 cfs on Johns River corresponds to approximately 0 on the painted Wilson Creek gauge. Keep in mind that Wilson Creek is a tributary to Johns River, and that the Johns River reading is a clue as to what was happening in the Gorge about twelve hours earlier. 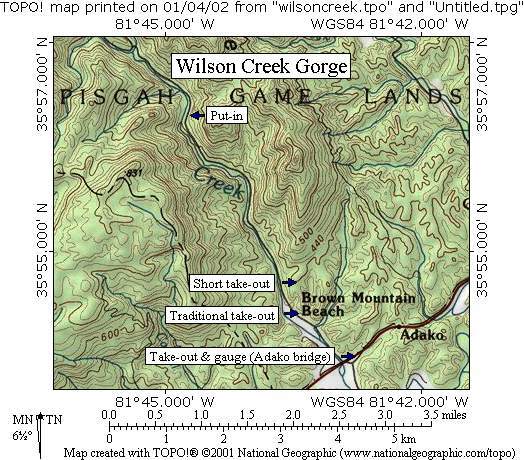 It is often true that when the Watauga at Sugargrove gauge is between 180 and 650 cfs, Wilson Creek is running. Another way to learn the flows on the Watauga is to call the TVA at 800-238-2264 or visit them online: TVA Streamflows. 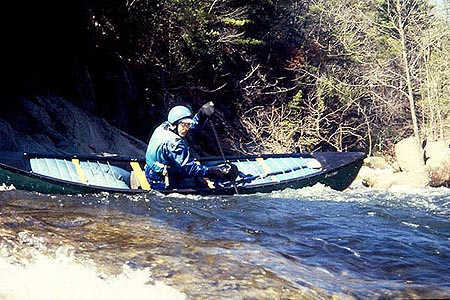 V (very pushy) Over 12"
Other sections: Bob and David Benner's Carolina Whitewater: A Canoeist's Guide to the Western Carolinas describes several easier sections both upstream and downstream of the gorge. If Wilson Creek is too high, Benner & Benner provide a number of alternatives including Upper Creek and Steele Creek. If Wilson Creek is so high that access to these alternatives is blocked due to flooding, consider running the Upper Yadkin. Put-in: First pullout after creek begins to flatten out and get relatively close to road. This is a short distance upstream of Ten Foot Falls (visible from the road) and 3.15 miles upstream from the Adako Road Bridge. Take-out: Adako Road Bridge. Alternate take-outs include the Brown Mountain Beach Campground (0.9 miles upstream from the Adako Road Bridge -- this is the traditional take-out, but the owners have not granted permission for boaters to take-out here for several years due to bad experiences with boaters in the past) and the first pullout after USFS 1328 turns to gravel (1.4 miles upstream from the Adako Road Bridge; hike down when running shuttle so you'll know where to take-out). Most boaters use this later take-out to avoid the mainly flat water paddle to the Adako Road Bridge. In doing so they miss a nice rapid with the best surfing wave on the river. Take I-40 East to Exit 100 (Jamestown Road). Turn left off the exit ramp and drive 3.4 miles to the "T" intersection with NC 181 North (the name of the road you'll be on will change from Jamestown Road to Independence Boulevard at a stoplight just beyond a very impressive carbon mill). Turn left onto 181 North and drive 10.7 miles to Brown Mountain Beach Road. Bear right onto Brown Mountain Beach Road. Drive 5.0 miles to the Adako Road Bridge over Wilson Creek (I believe the name of the road you are on changes to Adako Road at this bridge!). Turn left onto USFS 1328 and park. The take-out and gauge are on river-left under this bridge. Camping: The USFS Mortimer campground is located 5.3 miles upstream of the Wilson Creek Gorge put-in. Sites are $4 / night from April 1 to October 31, free during the winter. Twenty-three sites, no reservations or minimum stays required. Vault toilets, running water in season (4/1-10/31). To camp free between April 1 and October 31, drive 4.0 miles back towards NC 181 on Brown Mountain Beach Road from the Adako Bridge take-out. Turn right at the Oak Hill Fire Station #2 (a left turn would put you on Piedmont Road). You'll see a "Public Dove Hunting Area" sign. There are tons of places to set up camp and it appears hunters often do. No running water or toilets, but the price is right. Other: Wilson Creek is closer to Hickory than Asheville. For the current weather in Hickory, click here: wunderground.com. If camping overnight, check out the Brown Mountain Lights, a mysterious phenomenon that can be observed near Wilson Creek. Learn more at UNC-CH's Ibiblio Brown Mountain Lights page (part of an archive of NC ghost stories; here's a link to the rest of Ibiblio's ghost stories!). This is one of my favorite runs in the Carolinas. The water is clean, the scenery beautiful (despite the presence of the all but unnoticeable but nearby road), and the rapids fun but not scary at most water levels. The reason I recommend paddling all the way to the Adako Bridge at least once in a day's runs (multiple runs are easy to arrange and very common) is that the best surfing wave on the river is located about half-way between the closer take-out and the traditional take-out at Brown Mountain Beach. Unless we repair our burnt bridges with the owners of Brown Mountain Beach, the best way to access this wave is to play the heck out of it and then paddle the mile of mostly flatwater to Adako Road flush with the happy glow of an outstanding play session. Wilson Creek gets harder and harder the higher the flow. The highest I've done it is 18" above 0. The highest I know it has been done is 24" above 0, though parts of it have been done at 3 feet above 0. Any run over a foot is a fairly serious undertaking.